typetastic.com/ (COPPA-compliant ads) ■ edu.typetastic.com/ (ad-free, teacher sign-up required) ■ Retail Price: Both versions are free. Product Description: TypeTastic! 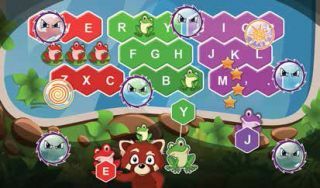 is an interactive, game-based program designed to help K–5 students build typing proficiency, one fun-filled game at a time. Quality and Effectiveness: TypeTastic! uses leveled gameplay to engage students in learning how to use a mouse or touchscreen and progressing to letter placement recognition and using keys on a QWERTY keyboard. Designed for students in grades K–5, TypeTastic! offers more than thirty different games and ten skill levels. During each game, students can recognize and correct any errors in order to complete the task. For the more basic levels (Let’s Build a Keyboard and Hop onto the Keys), there are no time limits on game play. This eliminates anxiety and enables students to learn at their own pace. After completing each game, students progress to a new game and build on skills learned previously. TypeTastic! helps students build skills in the following areas (depending on their grade and typing skill level): placement of keys on a keyboard, hand dexterity, typing from muscle memory, letter recognition, color recognition, punctuation recognition, reading comprehension, ordering, and problem solving. Ease of Use: Because TypeTastic! is browser-based, it doesn’t require preloading of software onto computers or devices. The TypeTastic! interface is organized, colorful, kid-friendly, and easy to navigate. Teachers have the choice of utilizing TypeTastic! or signing up for the ad-free version. Teachers who sign up for the ad-free version will receive an access code that students can use to log in. Each game level is clearly numbered, and a game begins with one click of the play button. Short, easy-to-understand written instructions are followed by a graphic interpretation of the instructions and modeling of the game. The scaffolded instructions allow all students, emergent and fluent readers alike, to understand the game task at hand. Bright colors, fun characters, catchy melodies, and sound effects all add to the overall appeal of this website. Where necessary, students have the option to mute the audio and play silently. Creative Use of Technology: Learning key recognition through game play allows students to be engaged in the learning process. As they play these fun and interactive games at each level, students gain not only keyboarding skills but also self-assessment skills, as they recognize typing mistakes, correct them, and move on. Because students are learning at their own pace in a risk-free environment, they remain motivated and learn valuable problem-solving skills as well. Suitability for Use in a School Environment: TypeTastic! is browser-based, so users can start to play immediately and seamlessly in a school or homeschool setting. The version with ads features only COPPA-compliant ads. Teachers and homeschool instructors can sign up for a free, ad-free version of the same program. The game-based approach to learning the keyboard, including the colorful, user-friendly graphics and interface, makes this program a great choice for teachers and homeschool instructors. Add to that the fact that it’s also browser-based and ad-free, and you have a winning combination. • Free, browser-based website with the option to sign up for a free, ad-free version. • Game-based learning environment, so students are building keyboarding skills in a fun and engaging way. • Multiple levels allow students to build and master each stage before moving on. Likewise, the ability to freely move to any level of play allows teachers to start individual students at their own skill levels.